I'd visited Montreal a few times before our trip this fall, but it was Dan's first time in the city! We stayed for three nights in Old Montreal in an Airbnb, near the basilica. 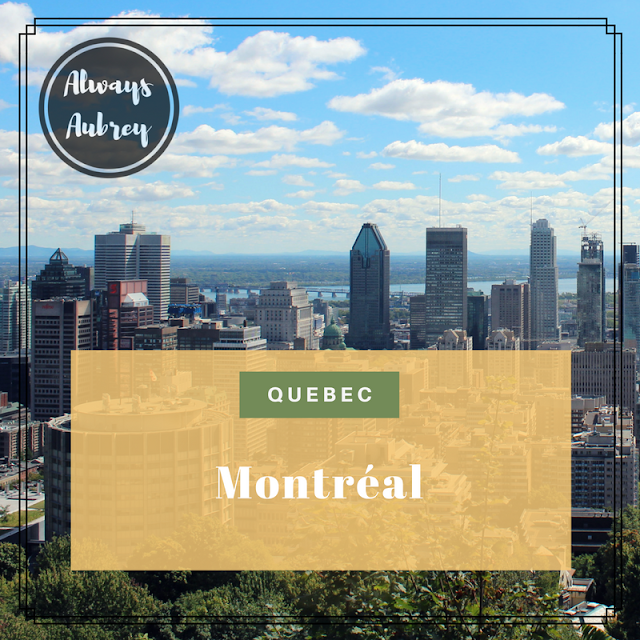 I'd always heard the view of Montreal from Mont Royal was beautiful, so one of our mornings we took the Metro to a spot near the park and walked up to the highest spot in the city for the view. I was NOT anticipating the stairmaster workout that would be required of us... I did not think this one through very well. Thankfully, Dan had a bottle of water, so we didn't die, and I got some much-needed exercise. But seriously, look at THE VIEW. Can you tell that I'm cranky and tired? No, because it was so nice and cool and pretty at the top, and we took a rest. Tons of others had made the hike, even though it was on a weekday. I was glad I'd decided to be hiker-chic and wear my Merrells. Honestly, I rocked those shoes pretty much the entire trip. Comfort first, style second for me on this kind of vacay. I don't know why there was a piano there, but it looked pretty. There was also a near lodge (with restrooms, vending machines, gift shop/info desk) with squirrel carvings. I was all about the squirrel carvings. The day we visited Mont Royal was kind of a stressful one for me. I really hadn't planned things well. So we had that monster hike to the top of Mont Royal, and then I was wanting to check out the Mile End neighborhood. 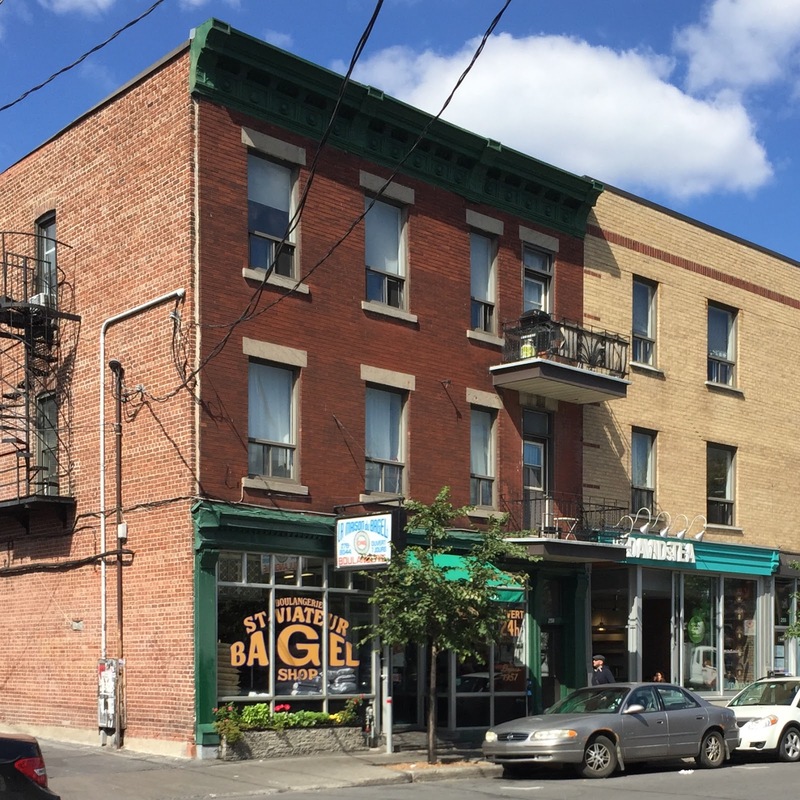 I'd heard it was a super hip 'hood, and that the original/famous St-Viateur Bagel shop was there. But by the time we got out of the park, we didn't find a great place to grab a cab, and Uber had a long wait. So somehow, despite my crankiness, we walked two miles to the bagels. THEN I HANGRY-ATE THE BAGELS BECAUSE I WALKED TWO MILES. The bagels are boiled in honey water, which is what makes them different from a New York bagel. We went in and got whatever they had hot and fresh, which is what I'd read to do. We weren't disappointed, and we devoured those bagels. NOM. After the bagels, we ate at a local crepe shop for lunch, which was just okay. Nothing to write home (or blog) about necessarily. I was kind of over hiking the city at that point, but I wanted to show Dan once of the big Montreal markets, so we took at Uber to Marché Jean-Talon. I think I like Marché Atwater better, but this one was still beautiful and packed with wonderful things to see and eat. We got some pastries, because after Quebec City, Dan was already in love with French pastries! The nice thing about the market is that it's also close to a subway station! We took the Metro back to the neighborhood where we were staying. We saw people headed into the Basilica Notre-Dame, and we decided we wanted to make sure to visit. The only downside? After we paid to get in, I realized my camera battery was dead. So once inside, only iPhone photo ops this time. Womp womp. But it's absolutely stunning inside and out, and well worth the price of admission. Even better? The organist was playing one of the regular concerts, so our visit was accompanied by magnificent music. We even sat to listen for a while. I got to hear one of my favs, Bach's "Jesu, Joy of Man's Desiring" too. The pictures don't do justice to the church's incredible ceiling, covered in stars! We also strolled through Old Montreal during our time in the city. It's mainly a couple of streets, the Old Port, and Place Jacques-Cartier in terms of shops and sights. It's pretty, has plenty of touristy souvenir spots, restaurants, and more. I must admit, after four nights in Quebec City, Montreal felt very urban and "big city" in comparison. After all, it has four times the number of people! It definitely strikes me as the Chicago or New York of Quebec, with all of the different neighborhoods, cultures, and cuisines. It's a special place unto itself, and I'm really glad we decided to split up the trip and experience both!